Crime and Punishment is a tough read but a rewarding one, thank you for this assessment. One of the best books ever written IMHO. And will remain one of the best I will ever read!!! I never had enough time and will to read this long book, which is by my opinion some sort of the psychological game, so instead I went to theatre and watched the play, which was by far easier to understand. True, I had to really invest all my senses, still there were a lot of portions that eluded my comprehension. This is one book that is really intense. It’s long too, and how the story unfolds, is quite unnerving, even shocking. I think, the adapted scripts for theatre and movies takes away that fierce intensity (my personal felling) and make it presentable for the audience. Even the classics adapted for the screen miss out the finer details from the narrative; it happens during the scripting. The point here in this book is ‘Are punishments a deterrent for crimes that may occur?’ Indeed, it’s the underlying narrative in this one. Yes, I agree, you can never show the audience in theatre and especially in the movies all this complicating things that are parts of the books, especially in those “hard books to read”, like Greek Classics or European Realism. I had the same feeling when I first read the book “The Roots”, and then later watched the TV Series. It’s a great psychological read. So much can be interpreted about his thoughts, actions, and consequences, as the narrative has been brilliantly written by Dostoevsky. It has been ages since I’ve read anything by Dostoevsky but I adore his writing. I actually like his lesser works more, I think. Have you read Poor Folk, by chance? It’s one of my favorites! I love your review, it’s beautifully written. Hi Alice, thank you for reading and appreciating the review. To be honest, the only two books of Dostoevsky that I have read are Crime and punishment and The Brothers Karamazov. Both were so demanding of attention, alertness, and mental workout. I gave up reading such challenging books long back, the last one I read was probably Lady Chatterley’s Lover. Your review seems to match the book so well Deepa, written with the same alacrity! As a student of Literature, I was expected to read so many difficult books…not to forget Milton’s Paradise Lost and Shakespeare’s Plays… that I yearned for some breezy stories and when I come across some, I feel those classics do have something special, if we pay attention but you can’t relax with such books. Thank you, Balroop for reading the review and for your response. Works of D.H Lawrence, Flaubert, Dostoevsky and a whole lot of classics are challenging, beyond doubt. It’s difficult to go through many of them. But some of them draws the reader deep inside(like the idiosyncrasies of Raskolnikov) that, no matter what, one tries to get to the gist of the content. You may have just given me the impetus to move this to the top of my TBR heap. Nice review. Hi Ilona, thanks for stopping by and commenting. We had the list 2 years before final exams, i was 16years old when i read it, believe me not easy.. I can very well understand the struggle you might have experienced. Do you have Flaubert’s books in school curriculum? I don’t really remember having this, but it wasn’t on the list to read, at least what i can remember..
…One of the most difficult writers to read, his psychological thrillers and deep critical observations of the Russian culture and society of the early-to-mid 19th century are nevertheless genius works of Russian realism and realism in general. Along with his biggest masterpiece, “The Crime and the Punishment”, it has to be mentioned his “Brothers Karamazov”, “The Gambler”, “The Idiot”, “The Grand Inquisitor”, “Demons” and all of his short stories and letters. So true….I guess all his works need to be re-read to get to the core of it. Yes, writers like him (Proust, Kafka, Flaubert, Tolstoy, Hugo; to name the few), has to be read more times, and as the start, sometimes its better first to watch a movie or go to the theatre, and then read a book. That worked for me very well in this type of situations…. Crime and Punishment made a deep impression on me. I felt like I was in Raskolnikov’s head, reading his thoughts and feeling his emotional outbursts. I also found myself hoping that he would get away with his crime, even though what he did was completely wrong and deserved punishment. Like all great novels, Crime and Punishment engages the mind and the heart. We get the feel of our lives getting wasted away in the attic along with Raskolnikov, thence the strange feeling of complicity in the crime. The serendipities too favour him at many instances. Arresting is a good way of putting it, and the ending really caught me by surprise. The popular American TV crime drama Columbo was inspired by Crime and Punishment. Each episode started with a murder, and we follow the criminal as Columbo, like Porfiroy, investigates the murder. Raskolnikov succeeded in dodging the forces of law, yet his conscience caught up with him and turned out to be his ultimate judgement call. The genius of Dostoevsky lays in depicting the nuances of Raskolnikov’s mind, so intricate that at times, readers are forced to think if the author himself had done such a crime before. 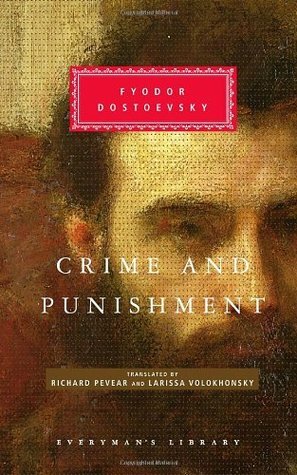 Crime and Punishment itself took the form of dramas, films, and series’ in so many languages. Nothing could relay the thrill to the viewers as reading the book, since we navigate Raskolnikov’s thought process more than his actions throughout. Another masterpiece that swept me off my feet was Flaubert’s Madam Bovary. When the author proclaimed,’I am Madam Bovary’, it had never been an overstatement. It’s a conundrum as to how a man could depict a lady’s mind like this, while even the sturdiest of feminists sometimes fail to. You’re welcome, Deepa, and I enjoy reading your thorough analysis. 🙂 Madam Bovary is also a masterpiece of literature, another novel in which you are in the mind of the main character and feel all their experiences. I admit to a very slow read through Crime and Punishment. By the time the murders are revealed you (reader and writer) come to understand the angst and anger of your protagonist. Dostoevsky mastered the character to the minutia. This relates to readers, how many people can relate? A lot! For writers, it is an exercise in character building. Granted, now we don’t write that much into our works, but we do have to build believable, almost living/breathing characters. My take on this is that there are only very few contemporary writers who could make the reader think and dream at the same time. We turn back to classics time and again for the same reason. It’s true that works of romanticism are difficult or impossible to be resonated upon. There was a drastic change when realism took over the genre of romanticism. Nowadays we get to read the run-of-the-mill being churned out and being awarded prestigious literary prizes on a daily basis. Not that all of them are undeserving.